Spring is officially here. Are you ready to jump-start your health? I challenge YOU to eat clean for 7 days straight, for every meal: breakfast, lunch, dinner, and even your snacks! …and I have the tools to help you! Eating clean can sometimes be a chore, as it is confusing! When you are only used to the endless, processed foods at the supermarket, sometimes you must question, so what is “clean” anyway? First of all, clean eating is not a diet-it’s a lifestyle. You are either in it to change your ways or you probably shouldn’t do it at all (shhhhh…you didn’t hear that from me!). I believe everyone has their own personal idea of what’s considered “clean eating,” especially since there is NO clear definition of what “clean” is. However, I would have to imagine that everyone would agree to some extent that the general definition would be: the elimination of processed, extra additives, chemicals, and refined foods in one’s daily diet. Instead, you are choosing to eat foods in their simplest or “whole” state. The easiest way to start eating clean is to prepare your own meals at home. Yes, this means you have to start learning how to cook! This way, you know exactly what ingredients you are eating and the amount of calories you are consuming. Here is a huge grocery list of clean eating foods. You do not (I repeat 🙂 ) do not, have to go out and buy every single item on this list. This is solely just to give you an idea of what is considered clean and for you to use as a guide for the future when you are grocery shopping. 2. In large bowl mix together the applesauce, vanilla, and protein powder. 3. Once all mixed fold in the blueberries, rolled oats, & melted coconut oil. 4. Place mixture in muffin tin and bake for 30-35min or until golden brown. 5. Let cool and serve! • Heat the almond butter & honey in a saucepan on low heat until melted. Stir & remove from heat. • Pour mixture over oats in a large bowl. Stir thoroughly. • Pour & press batter into a 9 inch baking pan and bake at 350 degrees for 15 minutes. • Remove & let cool. 2. Place one piece of ham in each tin. 3. 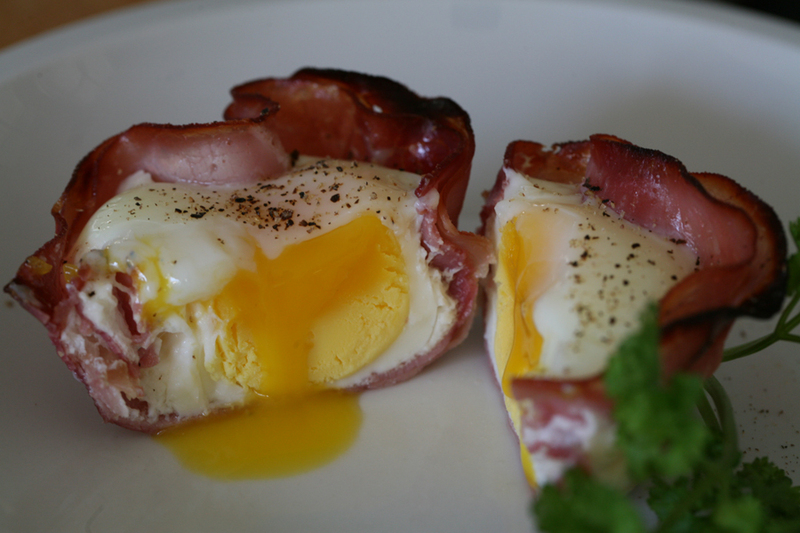 Crack one egg into each ham slice. 4. Sprinkle salt/pepper to taste. 1. In a skillet heated over Medium, brown ground beef. Drain. 2. Add in seasonings and mix well. Set aside. 5. Spoon ground beef mixture into each cup. 6. Bake for 15 minutes until corners of the wonton wrappers are golden brown. Remove from oven. 7. Top with your favorite toppings. 2. 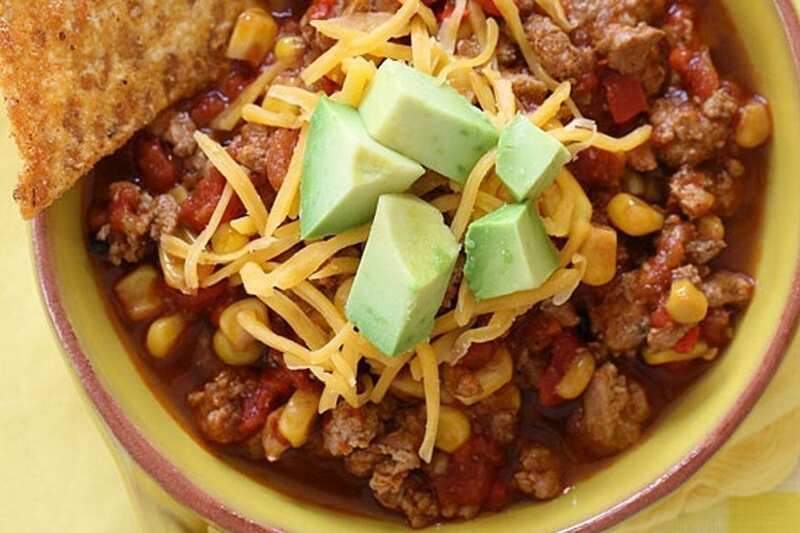 Combine all the ingredients together; stir well in a bowl. 3. Form around 20 balls out of the mixture. Put them on a broiler pan. 4. 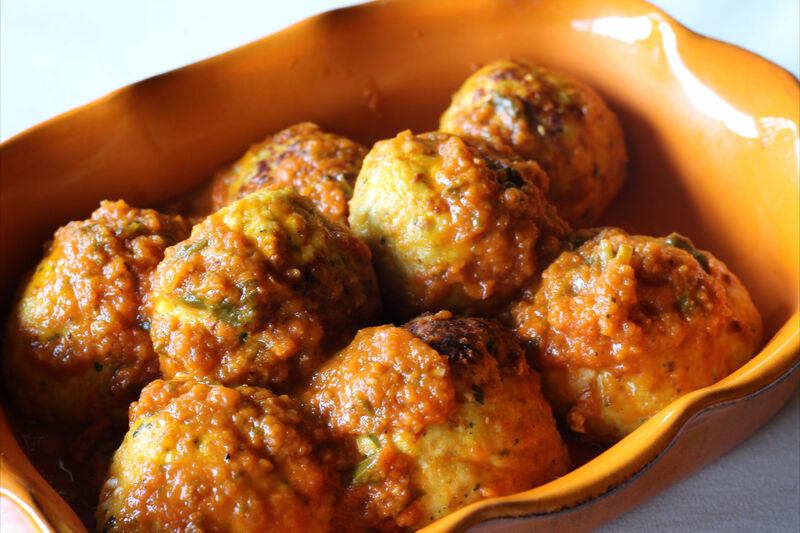 Bake around 15 minutes or until a cut meatball shows no pink inside. • Preheat oven to 350 degrees F (175 degrees C). Grease a baking sheet. • Mash black beans in a bowl; add onion, garlic, jalapenos, & bell pepper. Mix. Set aside. • Whisk water, sriracha sauce, ranch packet, chili powder, cumin, paprika, & garlic powder together in a separate small bowl. • Mix oats & egg into the black bean mixture. Combine with the seasoning mixture. • Spoon ‘burger-sized’ mounds of batter onto the prepared baking sheet, about a 3/4-inch thickness per mound. Shape into burgers. • Bake in the preheated oven until cooked in the center and crisp in the outside, about 10 minutes on each side. 1. Combine olive oil, lime juice, peel, cayenne, and cumin in small bowl. Thread shrimp onto skewers; season with salt and pepper. 2. Brush shrimp with lime mixture. 3. Grill until shrimp are cooked through, about 3 minutes per side, brushing occasionally with lime mixture. 5. Top each tortilla with shrimp, lettuce and any other toppings you would like. 1. Soak the beans in a large pot overnight. Drain and place into the crock pot. 2. Brown ground turkey in a skillet. Drain and place into the crock pot. 3. Dump the rest of the ingredients in and stir. 4. Cook on HI for 4 hours, stirring every hour. 1. In a large bowl, mix together the ground beef, eggs, and oats with an electric mixer or your hands (I love doing everything by hand!). 2. Next, add in the veggies, Worcestershire sauce, and seasonings. Mix well. 3. Form into a loaf using your hands and wrap in wax paper or plastic wrap. 4. Wrap in tinfoil & freeze. 5. Bake at 350 degrees when ready to cook. Want to spice up your winter? Well, I did, too…and I couldn’t resist these beautiful rainbow carrots with their vibrant, exciting colors that I came across recently at the PMA’s Fresh Summit Convention and Expo in Anaheim, CA. This absolutely gorgeous feast for the eyes and the tummy was inspired by their unique look! The colors are amazing–deep purple, yellow, red, white, peach and of course orange. 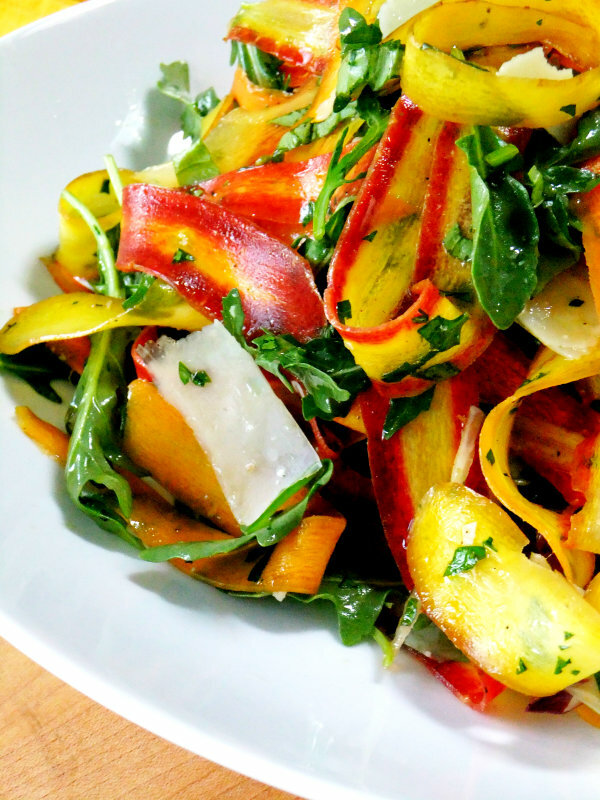 I decided to make a salad by shaving the carrots into ribbons using my vegetable peeler so I could showcase all the gorgeous colors inside. Surprisingly their flavor isn’t all that much different…some of the carrots might taste slightly sweeter than the others but you sure can’t beat the visual! Enjoy!! 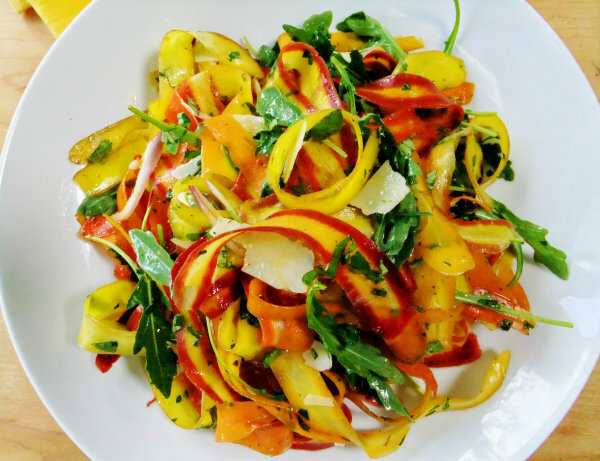 Use a large bowl to toss and coat every thing completely then place your salad on a platter. VINAIGRETTE RECIPE: 3 parts good olive oil to 1 part wine vinegar, a splash of balsamic, 1 smashed garlic clove, a dollop of dijon mustard, 1 teaspoon of oregano, 1 teaspoon of kosher salt, ground pepper to taste. Whisk everything together. Here’s to your health…and your senses!! 10 Foods You’re Eating Wrong …who knew?! Read on for your health! Not all food is created equal if prepared the wrong way. See which mistakes you could be making with some of your favorites. Steaming was the only cooking method that completely preserved, and even increased, the cancer fighting components of broccoli. Imagine the following scenario. You’re engaged in conversation at a dinner party with friends that you feel comfortable enough to discuss “hot button” topics with. Politics, religion, and parenting techniques probably come up and most likely, the views vary by person. When I attend dinner parties, however, the issue of food is often the hot topic of the night, and even hotter, the opinions surrounding the right and wrong way to eat. It’s not enough these days that we are eating more kale (thank you trendy farmers markets and Hollywood celebrities! ), we have to now dissect the right and wrong way to eat it as well. It was discussions like these that motivated me to write this blog. After all, my career surrounds helping people to simply eat better — to get, what I call, the most bang for their nutritional buck. 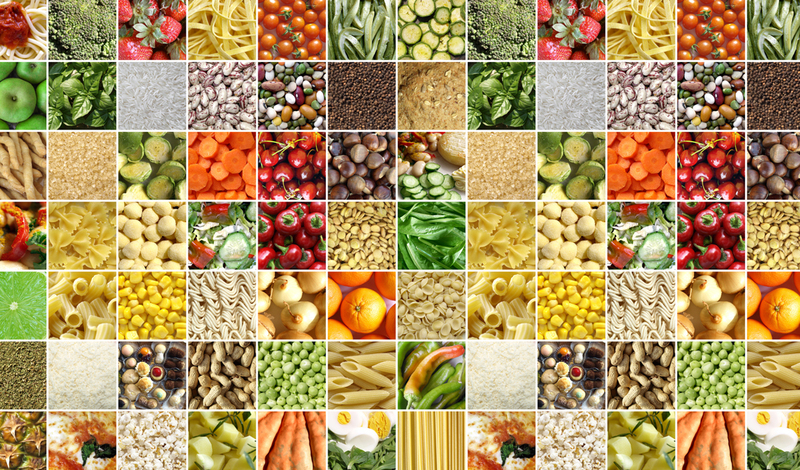 There are many factors that impact the amount of nutrients that you will derive from a food. Things such as cooking and ripening method, food pairing and even your own gut flora may impact how much benefit you get from plant-based foods. Different varieties of foods affect this as well. Not all nuts, apples or as you’ll read in my first example, potatoes are created equal. If you’re interested in knowing how science views the best way to eat, then read on. Spoiler alert: Raw is not always the right way to go! Think you’re getting the benefits of the potato vegetable when you consume French fries, mashed or baked potatoes from white potatoes? Think again! One study found that it was purple potatoes that gave the best benefits, like lowering blood pressure and reducing the risk for cancer. Further, a 2014 study found that purple potatoes surpassed their white counterparts when it came to high amounts of polyphenols and decreased effect on overall blood sugar response. As fall gears up, our love of soup increases as well. Next time you’re making a batch of chicken noodle soup, resist the urge to cut up your carrots. One study found that cutting carrots increased surface size and allowed more nutrients to leach out. That means after washing and peeling, your carrots should hit the water in their whole form. Keep cooking (vs. raw) though. 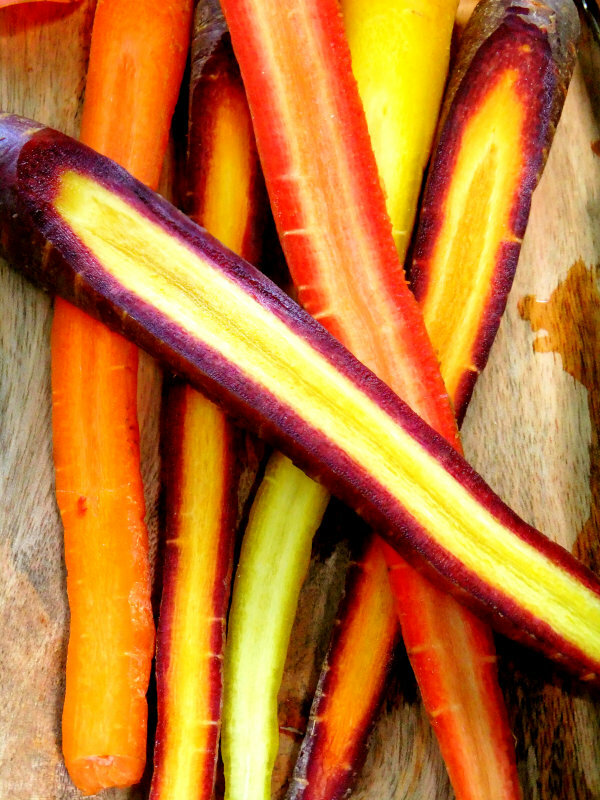 One study found that cooking carrots increased the bioavailability of carotenoids. If you want high nutrient absorption with your high tea, then forget about doing as the Brits do it! Several studies have shown that adding milk to your tea may actually take away some of the cardiovascular benefits that tea provide. Going with green tea? Add a little juice instead to sweeten. The vitamin C in juice may help to increase the bioavailability of green tea’s nutrients. Don’t rush your garlic, CRUSH your garlic! Research indicates that crushing your garlic and allowing to sit for at least ten minutes released an enzyme called allicin that has been shown to help reduce the risk of cardiovascular disease by making platelets less sticky or more likely to flow freely through the cardiovascular system. Fat free dressing may seem like a good idea in theory, but when you look at what you give up; it’s no match for the full fat counterpart. Several studies have shown the benefits that fat has when dressing your greens, from keeping you fuller and more satisfied after consumption to getting more nutrient absolution from your salad (specifically from lutein, lycopene, beta-carotene and zeaxanthin). Let your fruit ripen up a bit! One study found that the ripening process allowed the breakdown of chlorophyll in ripening apples and pears which, in turn, produced more “highly active” antioxidants in the fruit. Broccoli is, without doubt one of the best foods you can feed your body! Broccoli is part of the brassica family of foods, a family that has shown to be quite effective in terms of prevention of certain cancers from breast cancer to skin cancer , but how you prepare your broccoli makes all the difference in the world. 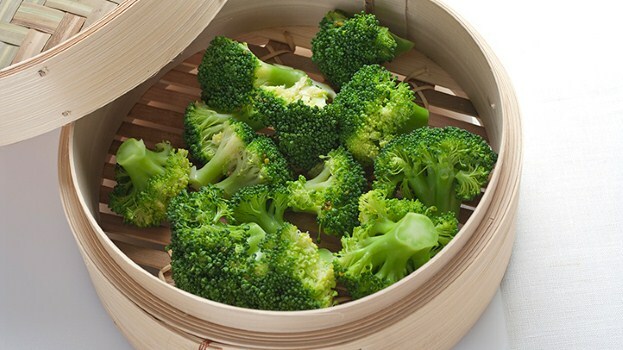 A 2008 study found that steaming was the only cooking method that completely preserved, and even increased, the cancer fighting components of broccoli. Boiling and frying were found to be the worst cooking methods. Still don’t want to ditch the boiled broccoli? Pairing with a spicy food may help! A 2012 study found that adding spicy foods to broccoli increased its cancer fighting power and the spicier the better according to the study authors! Mustard in any form is a fabulous condiment to add to sauces, salads and sandwiches, but if you’re interested in decreasing overall inflammation as well as reducing your risk for certain cancers then you better keep your mustard choices simple. That’s right! It’s the cheap yellow mustard options that have the best benefits. Why? Because they contain a compound called curcumin (that’s the active ingredient in turmeric) that not only gives cheap yellow mustard its yellow color, but all of its potential health benefits as well! While the factors discussed in this piece have an impact on the best ways to consume your foods, the truth is, simply adding these foods to your diet is a huge step in the right direction. Once you have mastered a liking for these healthier food options, the next logical step is to prepare in the best way for maximum nutrient density! 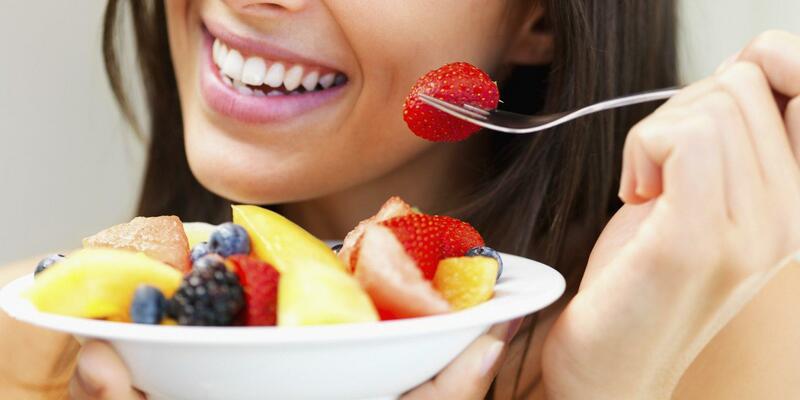 Eat more fruits & veggies for best results! !